The first recorded sighting of the Loch Ness Monster was in 565 AD, by Saint Columba. In modern times in 1933, the English newspaper the Daily Mail, announced that it was to hire a renowned big game hunter to track down the beast after several people all claimed to have seen it. In the 196o’s the monster was filmed for the first time. The loch is 24 miles long and up to a mile and a half wide. In 1970 sonar sweeps were made of the loch, and a picture was taken of what appeared to be a flipper about 6 feet in length. 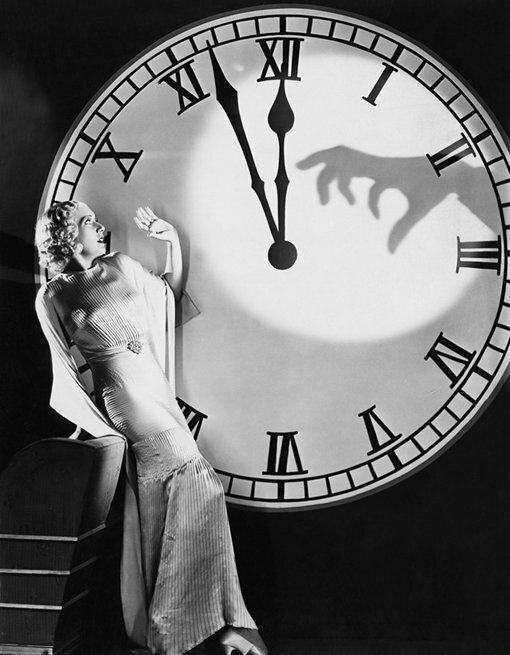 Throughout the 80’s and 90’s, monster sightings have occurred on a regular basis. 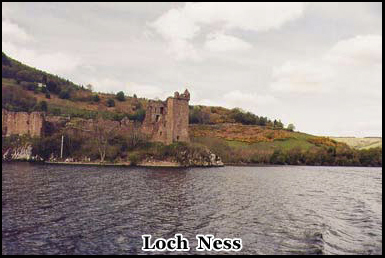 More recently “Nessie” was spotted in Loch Ness on one of the web cams that are now positioned around the perimeter. Loch Ness is twenty four miles long, one and half miles wide at its widest point, and has a maximum depth of 750 feet. There is a vast amount of water in which a monster could hide. Legends regarding one began in 565 AD when Saint Columba was reported to have rescued someone from a lake creature as he was walking along side the loch on the way to his monastery. Myth or still living prehistoric dinosaur. Whatever it is, sightings still occur hundreds of years later. This has of course put Loch Ness firmly on the tourist map. The Drummnadrochit hotel where I’m staying tonight, was where they shot part of the Ted Danson movie Loch Ness in 1983, there’s even pictures on the restaurant walls, to prove it. Although the lock expands southward for 22 miles, most of the sightings have occurred at its northern end where I am now. 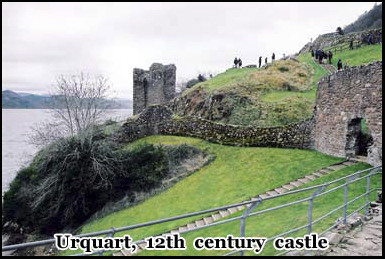 This is also the location of the famous ruins of Urquhart castle. 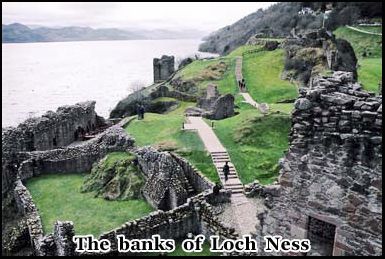 There also two Loch Ness monster exhibition centres, and several firms running boat trips for the tourists. But despite this the loch still does retain its sense of wilderness. There are only a few small hotels and shops, and most of the visitors seem to come from places, like Japan and America rather then from Scotland. Outside of the few big city’s Scotland is fairly sparsely populated, and there are no motorways at all in this part of the country. After staying the night in the Drummnadrochit hotel, I had breakfast and read one of the Loch Ness guide books. 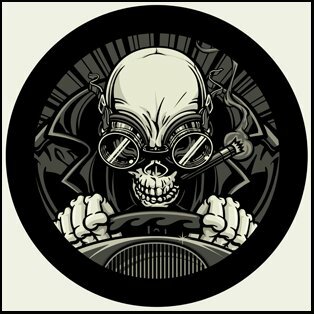 The reports of a monster have been taken seriously enough that there have been several scientific expeditions undertaken to see if evidence of its existence can be found. In 1972 the American Academy of Applied Science used sonar and underwater cameras to explore the loch and succeeded in captured what appeared to be a very convincing shot of a flipper approximately 6ft in length. Although when this picture was first published in the press, it had actually been airbrushed to give it more definition. In the 80’s, mini submarines tried to locate “Nessie” as the Loch Ness monster is also known, but failed to find anything. But hardly a month goes by without a tourist, or one of the local inhabitants living in the vicinity of the lake having some sort of sighting, real or mistaken. The common view is that the various descriptions of the monster, most closely match those of a Plesiosaurus which is believed to have been extinct for some 65 million years. This is actually not as far fetched as its sounds as in the eighty’s a species of fish was caught in deep water that was thought to have become extinct fifty million years ago. Until 1933 the loch was largely inaccessible but then a ring road was built around it, this led to more visitors and an upsurge in sightings. It was right after this that one of the first photographs of the monster was taken by a man called Hugh Fray. In the pictures you can see what appears to be several humps sticking up two or three feet above the surface of the water. I went to what is known as the “original” Loch Ness monster exhibition centre. This is located right next to my hotel and is the larger of the two exhibition centres. They have a high tech video presentation about the monster, as well as various exhibits concerning the geography of the loch. They also explore the scientific possibilities of a prehistoric monster actually surviving and being undiscovered for so many years. There is of course a gift shop on the way out, where you can by such items as “Nessie fridge magnets, and “Monster” cookies. If you go to Loch Ness, you can’t leave without going for a boat trip on it. The boats leave from a landing dock a few minutes bus ride from the hotel. They take you around the bay in front of Urquart castle and back. I booked the boat trip for 2 pm and caught the mini bus that takes you to the loch itself. The small boats are equipped with sonar, and are manned by people with a good local knowledge of the area. Some of them have laptops installed that provide you with a visual presentation to accompany your trip. As the boat heads out into the water, it does rock considerably as people shift from one side to another trying to get the best camera angles. The water of the loch is very dark, and visibility below its surface is very limited because of the silt the strong undercurrents create far below. It is a very small boat, and supposed to be a very large monster, but it is quite exciting to know you’re actually on Loch Ness. 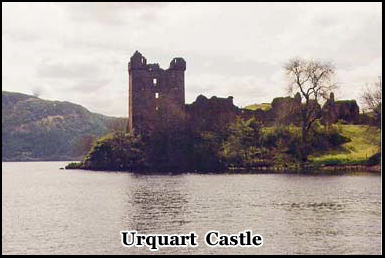 It takes about ten minutes to reach the ruins of Urquart Castle . The castle itself dates back to the twelfth century and had been under siege many times, from both Scots and the English. It remained fairly intact until the 17th century when it was blown up to prevent it being used by the enemy Jacabites. The ruins are open to the public and access it to it is a ten minute drive from the exhibition centre. Invariably the boat captain will have his own Loch Ness monster tale, and this particular one had several having lived near the loch for almost twenty years. The boat crosses over to the other side of the castle then turns around and heads back to the dock. If you look out behind you the loch does looks endless and it is in fact the largest body of water in Britain. But these days you can actually watch out for Nessie without leaving the safety of your home. There is a web cam trained on the lock, 24 hours a day and already there have been several reported sightings, and as technology advances, it may be possible that the monster could even be captured as a satellite image. Hey Buddy!, I found this information for you: "The Loch Ness Monster". Here is the website link: https://www.chasingmidnight.com/loch-ness-monster. Thank you.